My oldest son never really cared to drive. He was not one of these kids who was chomping at the bit to get behind the wheel. He often told us, “I have no place to be that y’all aren’t going.” While this was a bit of a blessing, no nagging for the keys or for a car, it also became a problem. He waited until he was 18 and about to graduate to take the Texas Adult Drivers Course. He passed the course and his online written test with flying colors, scoring a 97, only missing one question. He had the “book smarts” to drive… now to put it to use. By taking this online course, he did not have to take the written test at the DMV, so that eliminated one step along the way. We started practicing driving and he was less than thrilled any time we said, “You’re driving.” With him having zero experience, we started him out slow, down back roads, slowly moving him up to bigger roads. During this time, he had a few near misses. The very first time he drove on a farm to market road, a lady chasing her dog darted out in front of him, he had a hard time stopping in time but thankfully he did, but we were a bit shaken. The second time he was driving, he met a wide load as we were entering into a tight spot on a bridge. We were literally run off the road in the area (below) were the lane narrowed into the bridge area. So he did not have a good start to his driving career. These experiences reinforced in his mind that he was in no hurry to get his license and his independence, so we waited for him to overcome his nervousness, rarely getting him behind the wheel. After his gap-year, he landed his first job at a local store. Odd hours and early mornings, I quickly grew weary of taking him back and forth the quarter of a mile to his job. We began to get a serious focus on preparing him for his road test. After reading a few articles on reluctant drivers, we sat down and had a talk to figure out what we could do to make him feel more comfortable behind the wheel. Trying to force a reluctant driver to drive before they feel ready can be more hazardous than beneficial. He told me he always felt like he was not able to control our large crew cab F150 Ford Truck. Well then… it was time we got him something smaller! He needed his own “ride” anyway! He had saved up a couple thousand dollars and we loaned him the rest to buy a small used Ford Ranger. He and I practiced driving it around and immediately his driving improved and he was a lot less tense because he felt more in control of a smaller vehicle. One obstacle out of the way! He was also pretty stressed over the idea of taking the road test in a high traffic area. We live in a tiny town (population 700) with three larger towns 30 miles away in various directions. Instead of scheduling his road test in the larger of the three, we found out we did not have to test in our county and scheduled it in the smallest of the three towns. No city loops, no overpasses, no high traffic areas, just a nice little small town atmosphere in which to drive. He lives in a small town, works in a small town, so naturally he needed to test in a small town. At this point, there was no need to drive in high traffic areas until he has more experience which will come in time. We scheduled his test and the office gave him a date that was a month away, so we got busy! We would go to the town he was to test in and drive around, take him by the DMV after business hours and let him parallel park, and let him get comfortable with the area. I had him watching YouTube Videos that would give him tips and pointers on how to drive better and how to pass the test! We printed out the “How to Prepare for the Driving Test” pamphlet and studied it. In no time he was driving with confidence and accuracy. Finally test day arrived! We arrived at the DMV about 15 minutes before he was scheduled and the lady (who was very nice) took us in her office, we provided the necessary paper work which included the filled out Drivers License application, insurance card, and his learners permit. He took a vision test, took his photo for his license, signed his name, gave his finger prints, and paid $11. She explained to him the basics, that he would parallel park first, then do the rest of the test. If at any time he did something dangerous, or illegal or lost more than 30 points, he would then come back to the office and reschedule. I was very pleased that she never used the term “if you fail” she only said they would “reschedule the test.” She told him that when parallel parking, it didn’t have to be perfect, the main thing was, do not hit either pole and do not jump the curb, everything else was just points off. It was time for the test, she did a quick vehicle inspection and then got in the truck and they drove around to the parallel parking area. I could not see the parallel parking area from the lobby so I stood and waited for him to leave the DMV parking lot, I knew if he left, he passed the parallel parking! Sure enough, in just a few minutes, out the drive he went, I was so relieved, I knew if he messed up on any of it, it would be the parallel parking. I thought to myself, “He got this!” In a few minutes they were back. He walked in and didn’t tell me anything but I knew he had passed by the gleam in his eyes! We walked in the room for the final paperwork and the lady asked him if he nodded to me or anything to let me know how he did. He grinned and said, “No.” She then teased by asking if she needed to tell me what to expect in the mail from the officer about that stop sign (it was just a joke.) We all laughed then he told me, “I made a 92! !” Of course he also had to rub it in that he did better than either of his parents did on their test! I was so proud of him and so relieved. His dad and siblings were home cooking dinner when we got back and hubby and sister had made him his favorite dessert, cheesecake, as a congratulation!! The very first place he drove all by himself, was over to his grandparents house to tell them the good news! My baby is growing up, gaining independence, and taking yet another step toward his future. I am a happy momma! 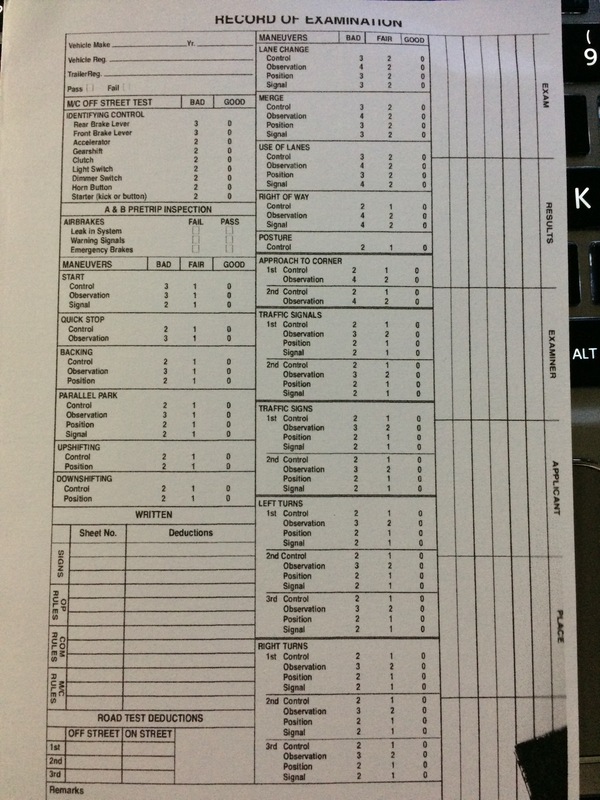 Here is an image of the Record of Examination so you can see what they (In Texas) fill out during the test. Posted on June 26, 2015, in Family, Homeschool and tagged Drivers Ed. Bookmark the permalink. 1 Comment.